The time is almost here! My Step Daughter is taking the PLUNGE. Pretty soon my Dear Hubby's second daughter will be married. I don't think it has hit hime yet! I'm excited to bring back photos of the event. in the forecast will hold off! At least she won't be wearing a toilet paper dress. 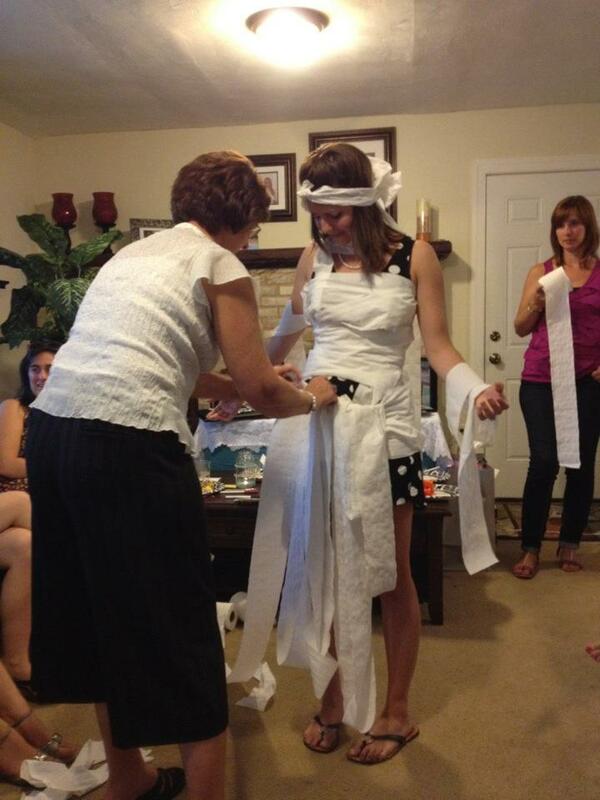 Like the one we all made for her at her bridal shower last week. There is something about the ritual of women surrounding the bride to be in friendship and love. A time for bonding. A time for layers and layers of little 2 ply cotton sheets. Who knew, back in the day, this would be a common theme at showers? I'll be back with an update on how the wedding plans are going... MAYBE a Pink Saturday post and then the wedding photos! Looking forward to the happy occasion! Coming up: A Vintage Holiday Ornament Sneak Peek!